Google Analytics is one of the most comprehensive free tools available to track the statistical data of a website. The main objective of GA is to provide certain statistical metrics of your website and it answers the question what. Example: Pages that have received high pageviews. To get the big picture of why it happened, you require a CRO tool to answer it and that’s how Freshmarketer comes into play. Sessions - The total number of sessions within a period of time. 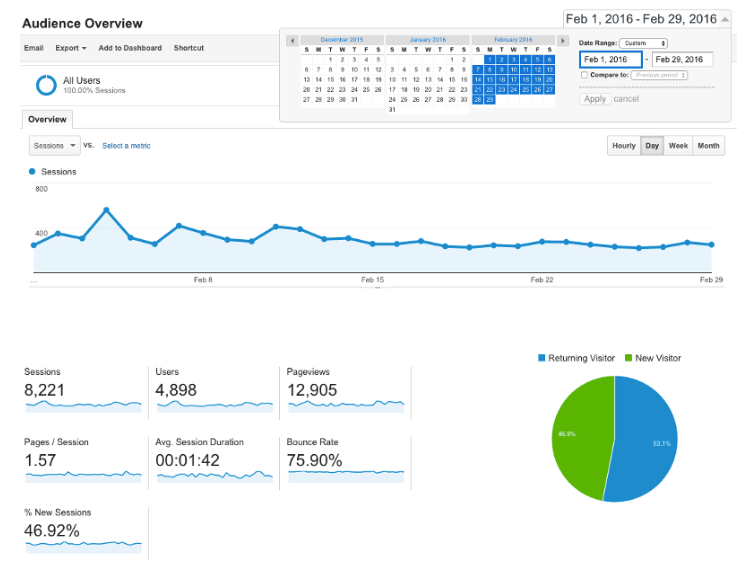 Users - The total number of users who visited your website in a given time frame. Pageviews - The total number of page views received within a period of time. Pages / Sessions - The average number of pages that are viewed in one session. Avg. Session Duration - The average time a visitor stayed on your website. Bounce Rate - The percentage of single-page visits in your site. Get statistical Google Analytics data for each variation in your experiment. Filter visitors of your website who are involved in your Freshmarketer experiment, through Google Analytics report. Find how Freshmarketer affects the above-mentioned metrics of Google Analytics. Example: See how bounce rate varies for your variation page in comparison to your original page. To integrate Freshmarketer with GA and gain the blended benefits, walk through this guide.